This year, 2018, we commemorate the end of the First World War, 100 years ago. In two years from now, 2020, we will be commemorating 80 years since the Dunkirk evacuation, the first major event of the Second World War. It is sobering to reflect how close in time these events are, just a little over 20 years apart. It is clear, that far from being the “war to end all wars” the First World War was merely a prelude to the Second. From “Guernica” by Pablo Picasso through to modern graphic illustrators such as the French artist Sara, black and white imagery has been used to powerful effect to depict the horror of armed conflict. It is these sources that were the inspiration for my chosen colour palette. 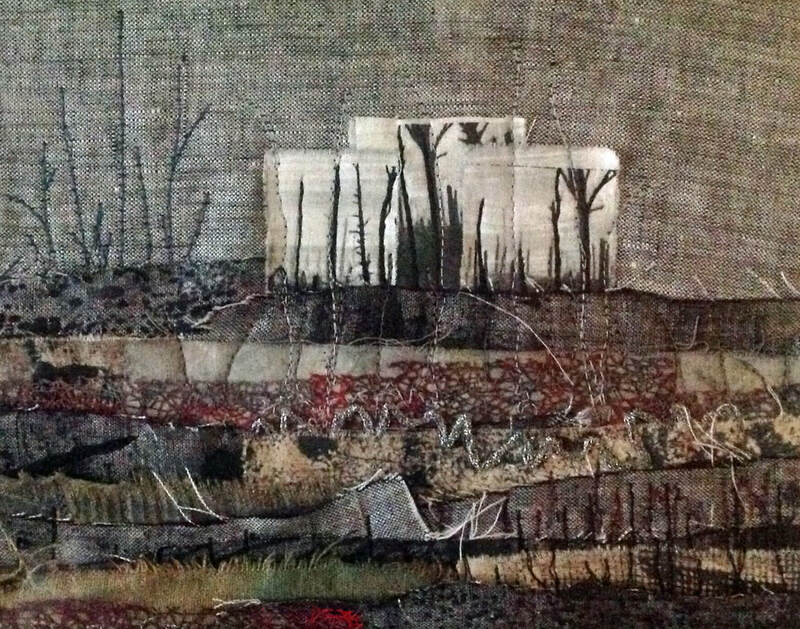 My piece was created as a lament to the devastation of the landscape and the destruction of a whole generation of young men, obliterated during World War 1. I interpreted the ruined landscape in the inspirational image as a metaphor for the fallen youth. It is also intended as a tribute to Eric Yarrow and the other members of his company, the 7th Battalion of the Argyll and Sutherland Highlanders who were cut down in the second battle of Ypres in 1915. Close by each simple cross….. The dark fabrics used in the composition are photocopy prints onto cotton fabric of a swatch of Black Watch Tartan, inspired by the Argyll’s kilts. The paler cylindrical shapes, representing both the fallen trees and fallen youth, are created from printing manipulations of the photograph of Eric Yarrow, found on the school website, printed on linen fabric. 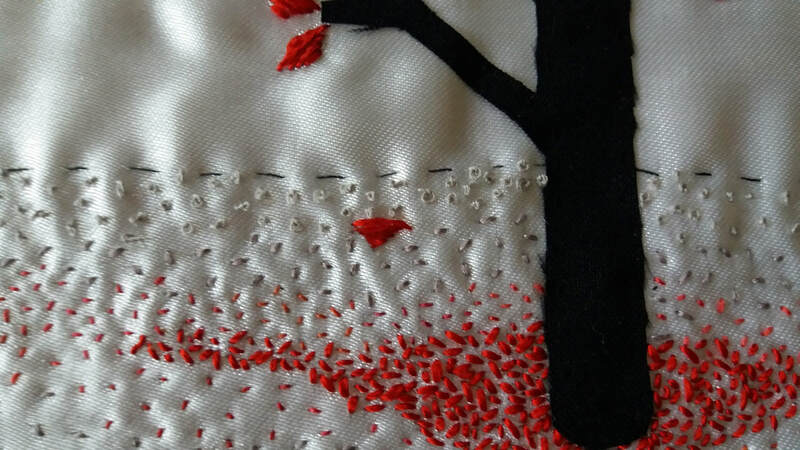 The background fabrics are torn, distressed and layered, stitched in place with irregular cross stitches. 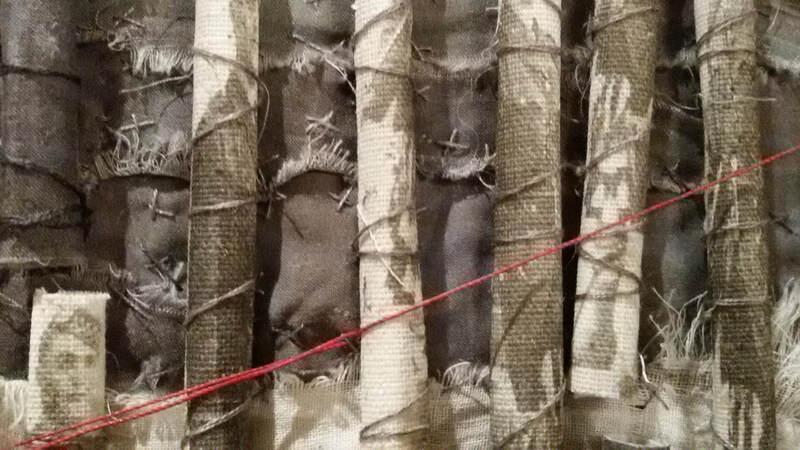 The red silk thread cutting across the composition symbolises the bloodshed and echoes the strong lines of the wooden walkway in the inspirational photograph. ​I was forcibly struck by the contrast between the devastation and desolation of the blighted landscape depicted in the chosen photo with the soldiers passing through it, uninjured and smiling. Although possibly ‘walking to their deaths’, perhaps they could still reflect on previous happy lives and even believe in a happier future. This contrast is shown by the reflections and highlighted by the colour palette. On first seeing the black and white photograph of the battlefields at Ypres, I was struck by a dreadful feeling of despondency for the soldiers - the bombed wasteland, the mud, the men surrounded by destruction. This represented the grim reality of war. I was so struck by the destruction of the landscape in the image the group has been working from that it led me to create an abstract image of chaos, a river of blood, barbed wire and trees, destroyed, which stand proxy for the damage inflicted on the men. It stands as a reminder of the losses inflicted on so many millions between 1914 and 1918. Working out of my comfort zone I used folded paper, dye, Inktense blocks, scrim and sticks, hanging the work on hessian with barbed wire. What stitch there is holds elements of the composition together but stresses the stark and bleak nature of the image we worked from. ​The desolate landscape with leafless trees, mud and fallen trunks, turned my thoughts to the men who did not return from the battlefield, unlike their comrades in the photograph. 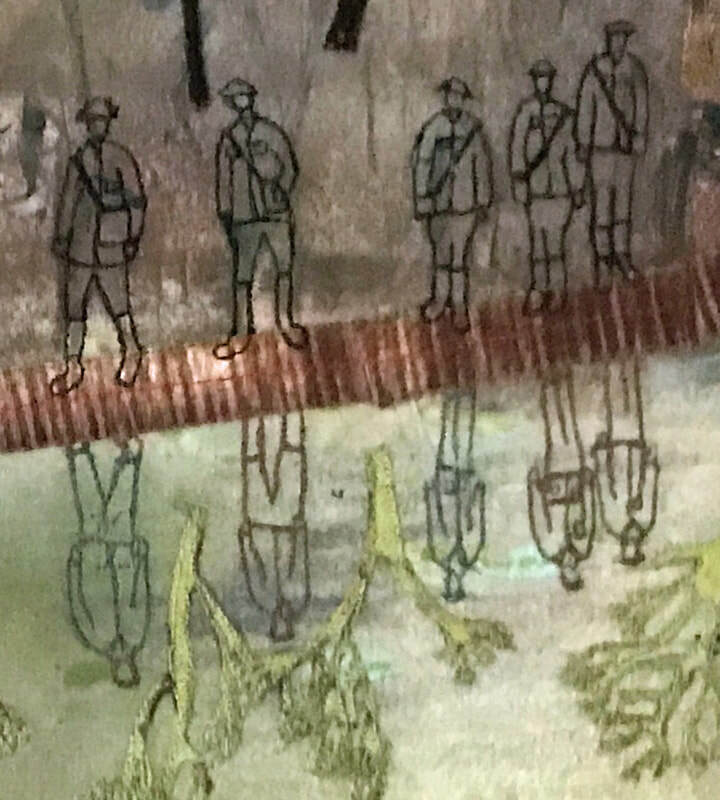 The landscape was created with dye paints; positive and negative images of soldiers were stencilled in with oil paint sticks. Machine stitching added highlights and texture. The countless white crosses in mute witness stand…. In 2016 I visited the Royal Academy’s Abstract Expressionism exhibition. I expected to enjoy the work of Jackson Pollock and Mark Rothco but was stunned by the pieces by an artist I had not heard of – Clyfford Still. I liked all his work on show but in particular the huge canvases using blocks of colour with no curves. 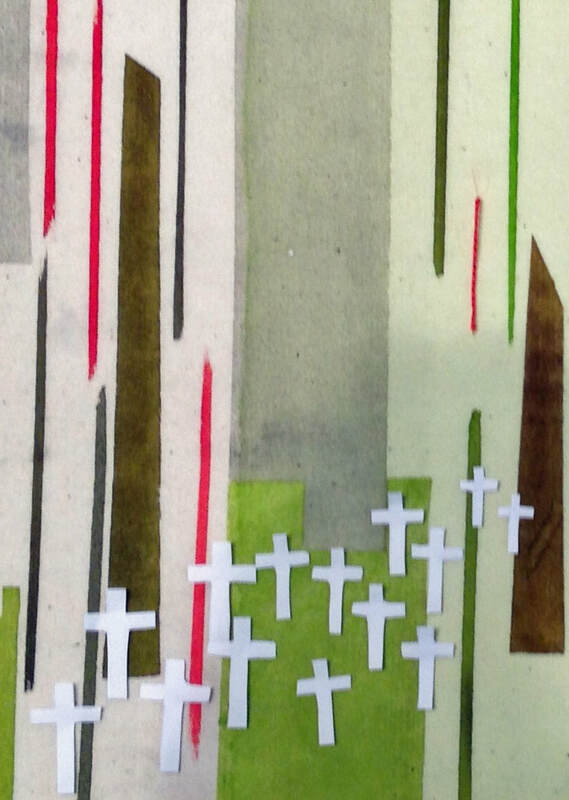 These gave me an idea for the background of my piece, Countless White Crosses. I painted calico with dyes, added the crosses then, a first for me, decided to add no surface stitching. 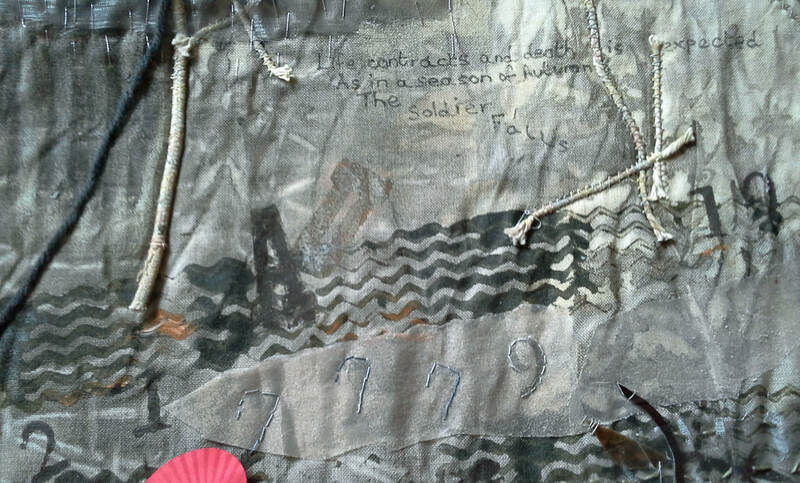 ​This work was made to commemorate those who fell in the Great War, particularly two members from my own family. My maternal grandmother's husband, Urban, aged 32, fell in the battle of Arras and left her with four young children and seven months pregnant with another, born two months after his father's death and who, sadly lived only three short weeks: they already suffered the loss of another infant child. My mother was only six years old when her father died. My father (then also aged six) lost his eldest brother, Arthur, who drowned when the ship carrying his regiment to the Eastern Mediterranean was mined in the harbour at Alexandria, Egypt on the last day of 1917: he lies in the CWG Cemetery there. He was unmarried, aged 20 and left his parents, five younger brothers and one sister. I have tried to picture the chaos and devastation of the surroundings that the soldiers in France had to endure and although Arthur was not a victim of this theatre of war it is right to remember the many servicemen who fell in other parts of the world during this conflict and who are not perhaps given as much focus as those who fell in France.